Helping to preserve the legacy of wind-millers and an icon of the American West ... Through training in windmill erection, repair and wellhead protection. Windmills are an icon of the tenacity and endurance needed to make uninhabitable lands livable and productive. For well over a century and a half, windmills have helped enable generations of farm and ranch families to secure a living from the land. As testimonial to the windmill's durability and efficiency, even in today's high tech world, windmills continue to provide water to farm and ranch operation throughout the country. As a tribute to the contribution of windmills to America's agricultural heritage, the NMSU Windmill Technology Center maintains a small collection of windmills on NMSU main campus. 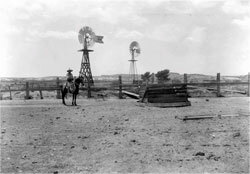 An attractive display of popular windmill makes and models is the background setting to the NMSU Alumni & Visitor Center, home of the Zuhl Geological Collection. Together, the Windmill Technology Center and the Zuhl collection comprise a "must see" destination for visitors to NMSU. The Center serves not only as a contemporary collection of modern windmills. It is also a teaching laboratory for the annual Windmill Technology Certification Workshop established in 1975. Each windmill is a working model of typical mills still found in use. Windmill aficionados will appreciate the historical antique collections of the American Wind Power Center and Museum in Lubbock, Texas. Improvements and upgrades are always being planned to enhance the NMSU Windmill Technology Center. Efforts are ongoing to established xeric landscaping, shaded seating areas, and improved safety measures for the Center. These improvements can only be installed with the help of private and industry support. If you would like to see the legacy of windmills continued at NMSU - become a program sponsor. Contributions are always needed and always appropriately recognized.